Re: Roadcaptain's 77 Build Thread. 16. Install, Admire & crack open #2 (or 3). I did for get the burps and gurgles. They should be at #s 4,6,7,9 and 14. Pretty sure there are pee breaks too. keep up the awesome work.. Both seats in as of yesterday. Tilt/floor shift column and console/shifter next. Was doing searches last night for info. Looks like brackets for shifter may be a bit of a challenge. I've got a Chevelle/Monte column but I'm not sure what year it's from. From what I've read, I may run into trouble because there is a difference between 74-76 and the 77 columns. Are you going to keep the wood grain on the shifter plate? 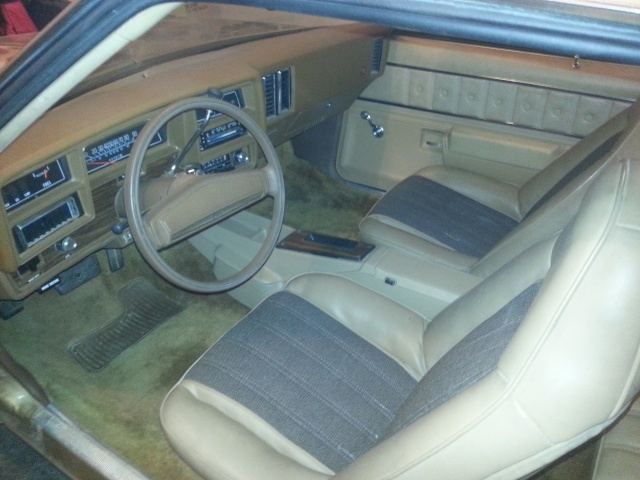 I am going to redo my console when it gets a little warmer and I am unsure what to do with the wood grain shifter plate. I'm not going to have any wood grain so it doesn't make sense to keep it. I might paint it black or paint it the color of the console which will be red. Yeah, It still looks good and matches the wood grain around the gauges so I'll hang on to it. For now the overall plan is to keep her in stock configuration. That's why I'm using factory/ period correct stuff instead of upgrading to aftermarket parts. It's such a nice example of the era, I can't bring myself to change the look of anything. Hawk03 wrote: Everything looks great! Just a idea you can get a piece of aluminum and take the fine grinding disc to it after you have it cut to shape. Prep it and spray some rattle can clear on it and you have a look like this center section of sub box I did. You can also spray some thin coats of color on it if you like then it looks like this. Hawk I would swap you my Black one for your woodgrain top plate ? If you have an extra console glove box lid in good condition I could sure use one. I looked in the pile...nada. really? you would think this was my first rodeo,i knew what part you were referring to..
the vinyl dye looks amazing. where did you get it? I think I got that one from Summit...it's too light, but as close as I could find. Roadcaptain S3 wrote: I think I got that one from Summit...it's too light, but as close as I could find. okay, that makes sense. I checked local hardware and auto places and no one seems to have the vinyl dye. they have duplicolor fabric and vinyl but I donno if I trust it. but you console looks so good now that I want to give it a shot. 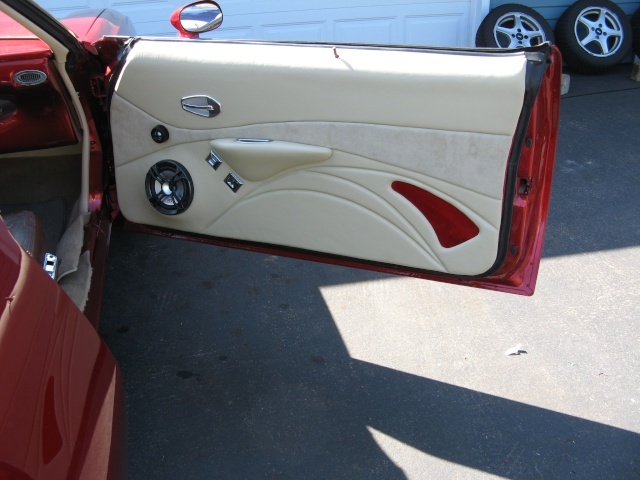 what did you use as an adhesion promoter and what sand paper for scuffing 220? 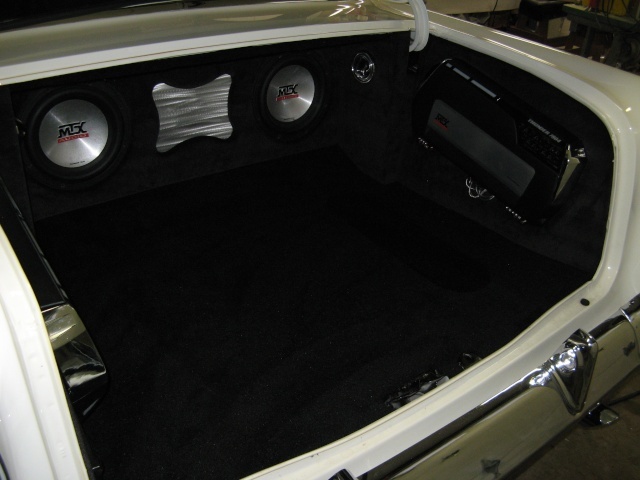 Seats in, console in place (not permanent yet, still working on kitchen) and got the new floor mats a few days ago. You can see the slight diff in color between the console and seats/door panels here. This REALLY shows the sun fade on the carpet. See how well the mats match near the trans tunnel, but the huge diff between the mats and the rocker side? 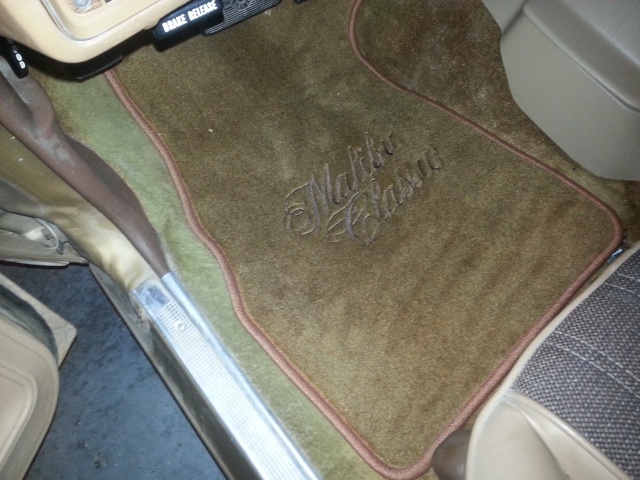 The mats came from Auto Custom Carpets (ACC). They were the ONLY comapny I could find that had the right color and the "Malibu Classic" embroidery. I looked into replacing the carpet altogether, but read way too many complaints about fit. I replaced the carpet in the Laguna and it sucked. It was lumpy and puffy around the trans tunnel, and I didn't read any reviews from any car guy that didn't say pretty much the same thing about most aftermarket carpet. Mine isn't worn at all, and the mats go a long way toward covering most of the sun fade. Those dyes are usually in stock at most auto parts stores, but they NEVER have the color you need. I normally go straight online to Summit, Jegs,NPD etc. Amazon too. I use the SEM clear adhesion promoter. You spray it on and let it get a little tacky, then spray the color. I use a green 3M scuff pad, sometimes I'll use the red pad on hard plastics. I don't scuff too hard, just enough to give the promoter something to bite on. I use a green 3M scuff pad, sometimes I'll use the red on hard plastics. I don't scuff too hard, just enough to give the promoter something to bite on. thanks a lot, I definitely want to give this a go. works best, and if your item has a heavy grain you mess it up. I got a good set of factory belts from ebay, but like I said in previous post...no luck with dying. 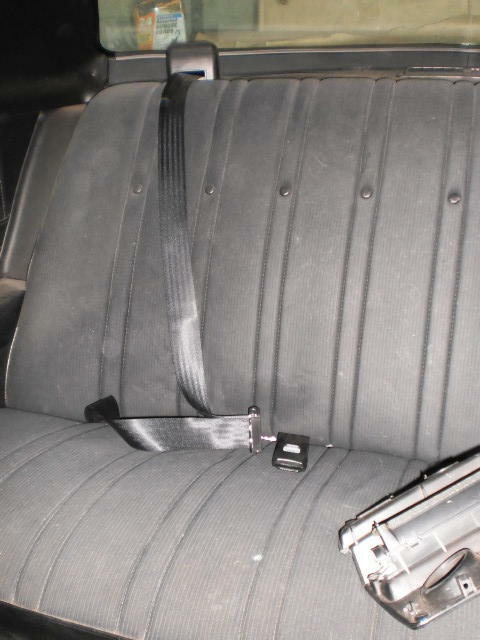 The swivel belts for G3s are weird compared to most other cars because of the way they mount. I don't think there are any other cars that have two separate retractors, upper and lower. Some of the eighties Camaros did, but I don't know if the upper retractor would fit properly on the roof of the G3. And you're still getting used twenty five year old belts that likely don't work anyway. 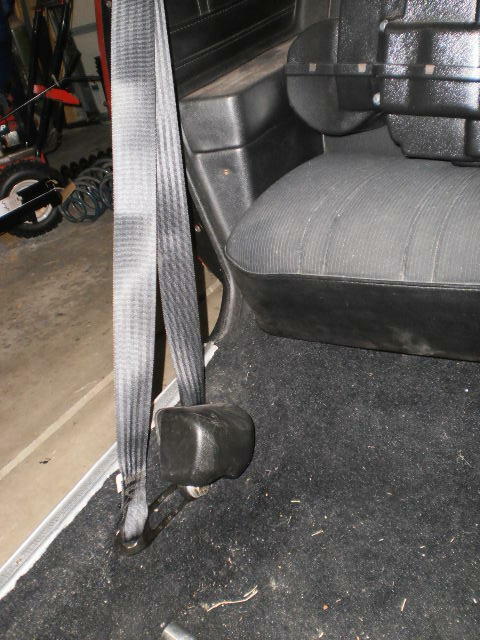 You run into problems at the lower retractor because the mounting point at the rear of the seat can interfere with the seat sliding back, since it's in the floor vs. the rocker. I think these might work if I mount the retractor to the floor and the end piece to the roof. Having a 73 model means I had that PITA 2-piece arrangement with a clip on shoulder belt, so I never had dual retractors. I converted to a standard floor retractor unit and used the shoulder B-pillar mount for the strap guide, works like a typical modern arrangement. 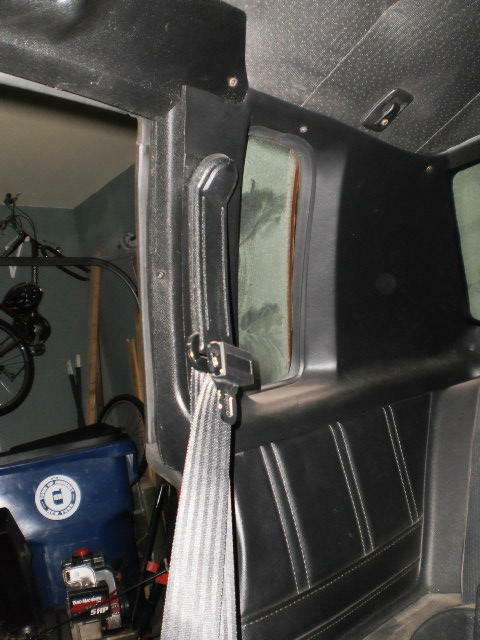 As for the roadster belts, I used those in the back seat -- mounted them to a hard point on the back deck so the rear passengers actually have a shoulder and lap belt arrangement. Works fine. » Can you Guess what it is yet? » JR Forza 450 build thread. » Rave 450 build thread. » Design and build your own kayak!